Background: Predicting disease-related genes based on gene network, is helpful for revealing the interactions between genes under complex disease phenotypes. There usually exist numerous noisy connections in gene co-expression network, making the simulation results greatly depart from the real situation. Most research focus on developing better similarity measures between genes to construct more accurate gene co-expression network. However, with the emergence of various types of biological networks and the urgent needs of precision medicine, the single source gene co-expression network is no longer able to meet the accuracy requirement for disease-related gene prediction. 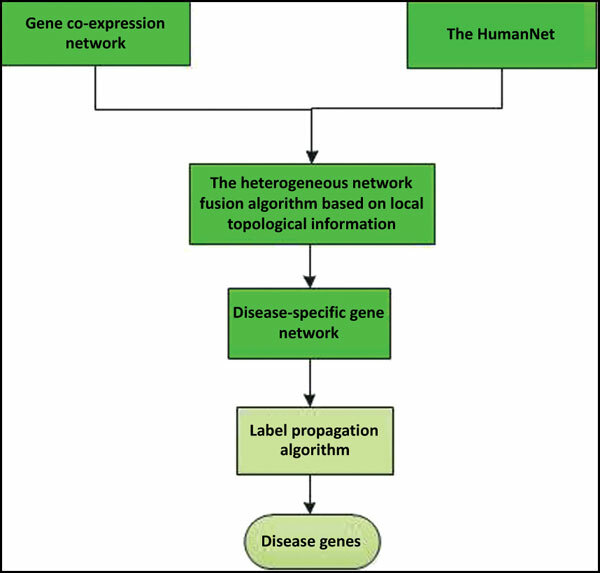 Objective: We have proposed a heterogeneous networks fusion algorithm based on local topological information (HNFLTI) to reconstruct a disease-specific gene network. We have also designed a novel framework based on the HNFLTI to identify the disease-related genes. Method: Firstly, HNFLTI modifies the weight of each edge that connects any two nodes in the gene coexpression network according to the topological structure similarity between the local sub-networks in different source networks. Secondly, HNFLTI filters out redundancy connections by a filtration step, obtaining the disease-specific gene network. Finally, we conduct label progradation on the diseasespecific gene network to predict the disease-related genes. Results: Experimental results demonstrate that the prediction accuracy of disease-related genes is significantly improved using the disease-specific gene network compared with that of the gene coexpression network. Conclusion: Since the molecular mechanisms of neurodegenerative disease are very complex, it is difficult to identify the disease-related genes using traditional computational methods. We reconstruct a disease-specific gene network using the HNFLTI to improve the prediction accuracy of disease-related genes and to conduct exploratory analysis of the molecular mechanism of the disease. The method might be one of the best choices when user wants to obtain reliable interactions between genes under complex disease phenotype. Disease-related gene prediction, gene co-expression, heterogeneous networks fusion, disease-specific gene network, local topological structure, neurodegenerative disease.